I had heard about the Lisa, but I had never had a chance to use the Lisa Office System (LOS). The reason was that the emulator project didn't have a working Lisa emulator, and neither did anyone else - until now. Ray Arachelian, creator of the Lisa Emulator Project, has finally created a working Lisa emulator (for more on that, see Interview with Ray Arachelian, Creator of the Lisa Emulator). I, like many others, have been waiting for years for this emulator to be up and running, so, I downloaded the Lisa emulator, got a ROM, and found a copy of the LOS, both of which are necessary for the emulator to work. I got a copy of LOS 7/7 Version 3.1, installed it on the Profile disk image, and started up the virtual Lisa. I'm going to show you several features of the LOS - I made over a dozen screen shots to help demonstrate. Notice there is one thing that Microsoft didn't steal from the Mac when they made Windows: the hourglass (the classic Mac OS shows a wristwatch). No, they stole the Windows hourglass from the Lisa. Anyway, you've seen the startup process - now down to business. First off, the Lisa really does act differently from other computers. For instance, you don't open LisaWrite, LisaDraw, or any other application, select the type of document you want to make, then make the document, anhd then save it with a title like you would on any newer GUI. On the Lisa, you tear off a piece of paper from a stationary (such as LisaDraw Paper or LisaWrite Paper) by double clicking on it. I wonder why this isn't the way modern operating systems work - it makes more sense to me. Another thing Lisa had was preemptive multitasking, so you could hold a menu open and the rest of the system wouldn't stop. Another thing you'll notice about Lisa is that there is no Quit option. You can set everything aside, set the document you are working on aside, Save and Continue, and Save and Put Away, but you can't Quit. The reason you can't quit is because all of the programs are always open. The LOS is totally document oriented. Another nice thing is that you never have to tell a Lisa to save something. If you do tell it to save something, it makes a reference file that you can revert to at a later time. Say you started working on something last week, and the last time you saved it was two days ago. The Lisa keeps track of all of the changes you made since the last time you saved, so every time you set aside your document, it updates it without even asking. But say you screwed something up in your document? You can simply tell Lisa to revert to the previous version! In fact, the only reason you would ever want to save anything on a Lisa is so you could revert to the previous version later on. Other than the revert feature, there's absolutely no reason you would ever have to save a document; it's automatic. Here is another thing I really like: If you have a document open on a disk and you try to eject that disk, the Lisa will save the document(s), close them, and only then eject the disk. This would come in handy if someone (like your boss) gave you another disk and told you to check it out. And as soon as you put the first disk you were working with back in the Lisa, it automatically reopens the document(s) you were working with just as you had them before you ejected the disk. The same thing happened when you hit to Power Button. Even if you have 20 documents open and you hit to Power Button, the Lisa will save all of them, set them aside, put everything away, and only then turn itself off. As soon as you turn Lisa back on, it reopens everything and puts it just like you had it before you turned it off. It works kind of like Sleep on a Mac, the only difference is all of your documents are saved. Another feature I like is when you tell Lisa to duplicate a file. It creates a flashing icon resembling the file you wish to duplicate. Before it duplicates the file, you have to drag the flashing icon where you want it before it duplicates it. I imagine this was because back in 1983 disk space was limited, and in some cases you didn't have enough room on the disk to simply duplicate the file on the same disk. Another thing that is a little strange - but not when you think about how things work in the real world - when you drag a program from one disk to another, once the file is copied, Lisa deletes the program from the first disk. This may sound strange, but when you thing about it, when you move a real file from one folder to another in real life, the file no longer exists in the folder from which it came. You're all probably wonder what the emulator is like. Well, it's very well designed. Not only does it emulate the UI, it emulates the entire computer, including the power light and the disk drives. 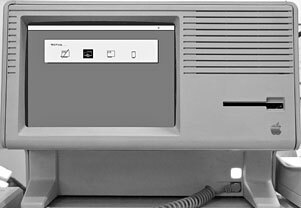 When you run the emulator, it really feels like you are sitting in front of a Lisa! As of right now, the Windows version is the only version where the disk drive motor sound and disk animation works, and there is currently no documentation on the emulator. However, the only major problem I have with the emulator is it runs really slow on my 733 MHz G4 (the emulator reports it is running at about 3 MHz, that's only 3/5 of the Lisa's slow 5 MHz hardware speed). Ray Arachelian assured me that the next release, due sometime next week, will run much faster on G4 machines. The Windows version, on the other hand runs pretty fast, so if you have a Windows machine, I suggest running the emulator on there for the time being (unless you have a really fast Mac). Well, I hope you enjoyed your look into the LOS. If you have any questions or comments, please feel free to email me. And be sure to stay tuned, because I'm in the process of interviewing Ray Arachelian so I can share more about the Lisa Emulator Project. Update: LisaEm 1.2.0 (released 2007.09.23) and later no longer require a ROM image.